1. The 1:72 Airfix Lynx Mk.8 kit was released last week. In the box you will find all the parts from the HAS.2 / HAS.3 kit, plus one additional sprue which carries the reverse-direction tail rotor, various noses with Seaspray radome and Sea Owl (HMA.8) or MST FLIR (Mk.88A) sensors, an inflatable crew seat, new sponsons, BERP rotor blades, Orange Crop ESM antennas, and various other aerials and antennas. No attempt has been made to change the shape of the engine housing or to make any provision for intake grilles. The weapons fit remains the same (torpedoes), and you won't see any parts for a HAS.8GM (Gulf War), so there remains plenty of scope for aftermarket accessories & conversions. HAS.3ICE, XZ238 / 434 / ED, Royal Navy 815 NAS, HMS Endurance / Portland, 1996 (the instructions say this is 'HAS.8', but we're not fooled. 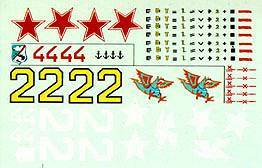 The decals are typical Airfix standard (adequate but unexceptional), with enough stenciling to keep most people happy. My main complaint is that the green in the Brazilian roundels and tail-flash is a horrible bright colour that is nothing like the correct dark green colour. Curiously, I saw a pre-release draft of the decal sheet on which the colours were correct. The decals on FCM sheet #72-12 are much better. The draft also had Harp markings for the HAS.3ICE which were dropped from the final version because Airfix couldn't be bothered to check with the Guiness company about any possible copyright issues. 2. Model Art have a Lynx HMA.8 decal sheet almost ready for release. This will include aircraft from HMS Lancaster, Coventry, Marlborough and York, all with interesting nose-art. Also coming soon from Model Art will be Aйronautique Navale H-19s in Algeria (3 tone colour scheme and 33F unit badge on the nose), as well as more Whirlwinds with (probably) an Italian SAR machine. 3. Airwaves are making a Lynx HMA.8 detail set, it ought to be available by next week. 4. We have more information about the 1:72 ZTS Plastyk Lynx HMA.8 (HKN #125). The boxart shows a Royal Navy Lynx firing a missile. On the reverse of the box you can see colour profiles of the versions provided on the decal sheet; XZ250 (1993), and XZ672 from the Lynx Operational Evaluation Unit (1995). 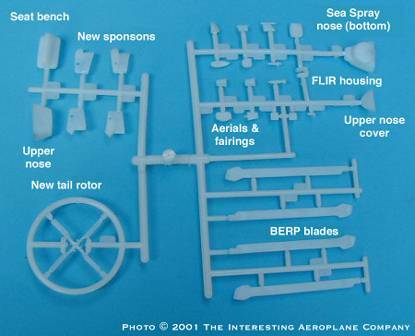 It appears that Plastyk have taken the same approach as Airfix in supplying all the parts from their earlier Lynx, plus additional BERP blades and nose parts. There are no separate doors or interior parts behind the cockpit, and the fit of the two body parts is 'not so good'. It all looks rather primitive in comparison with the Airfix kit. 6. Revell have announced an addition to their 2001 range,#4464, an SH-3H in 1:48 that I'm almost certain must be a re-box of the Hasegawa Sea King kits, which are currently out of production. The artwork at the Revell website shows a grey and white US Navy example. Provisional release date is September. 7. The 1:72 KP Mi-8/17 Hips have been re-issued in Russia under the Kopro / Mastercraft label. #KPC-071 Mi-17 HIP Soviet Army helicopter. 9. Clarifying the Aerocalcas Argentinas decal question (HKN #125), sheet #72010 does indeed have markings for two Argentine Navy Sea Kings; one in white over light grey from the Malvinas war, the other in the current low-viz scheme of dark grey over light grey. RAN-14 Sea King RAN HS-817 current grey scheme. 1:72 and 1:48 scale. RAN-08 Sea King RAN HS-817 75th Anniversary scheme. 1:72 and 1:48 scale. The next release, due in August, will be Canadian Kiowas in D-Day Anniversary schemes. The latest Model Alliance List is now available, combining the former Hawkeye Models Australia and Aviation Workshop lines. There are so many changes and additions that I have decided to make it available online here rather than try to itemise it in this edition of HKN. Email enquiries to Model Alliance, please, NOT to HKN ! 11. FCM have released decals #72-13 and #48-13. The 1:72 sheet includes markings for the following Brazilian helicopters: Army UH-60A Blackhawk (with MOMEP titles), a silver Air Force SAR H-19D, an Air Force UH-1D, and a Naval Esquilo, along with a couple of Learjets and a DC-6. The 1:48 sheet includes the Blackhawk as well as the Learjets, an F-5E and a Mirage. I have neither instructions nor references, so that's about all I know at the moment. 13. JBOT, a maker of Alps decals of Canadian Police vehicles, has recently expanded into 1:72 helicopter subjects, mostly civilian. 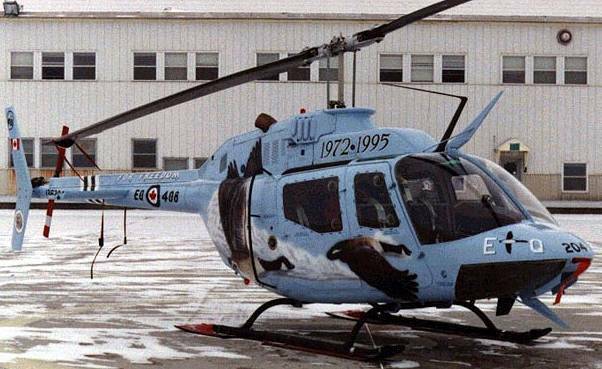 Bell 47G:, Canadian Coast Guard, Greece, New Zealand, etc, about 20 in all. 14. In HKN #120 I said I couldn't find any pictures of the Weserflug Skycranes. F-40 have come to the rescue - their new CH-53G book includes a section on these interesting CH-54A prototypes, including a photo of one with German military markings. There is also, for the first time, an introduction in English. The last three F-40 / DHS publications have been produced to a nicer (smaller but thicker) format, and the quality of the printing has improved markedly. 15. Burkhard Domke's photographs are always outstanding, and his latest are no exception. These show a Marina Militare Italiana EH101 at the Paris Airshow last month. 16. Modelling Madness have posted an article describing the conversion of the 1:72 Heller Fw-56 'Stosser' into a Fw-186 autogyro. 17. And here's an animation of the Focke Wulf Triebflьgel. If you have a website featuring model helicopters, please send me the address (even if you think I should know it already !). I hope to add a Links section soon. Lastly, I have at last found time to do a little work in the HKN Gallery. The Mi-14PL Haze link is now functional. Thanks to James Botaitis (JBOT), Joe Osmulski (Flightdecs), Tony Morgan, Gary Madgwick (Model Alliance), Pieter Marijnus, Drew Graham, Burkhard Domke, Yevgeny Borissov, Dave Fleming, Pawel Okulski, and Jean-Pierre Desprez (Model Art).